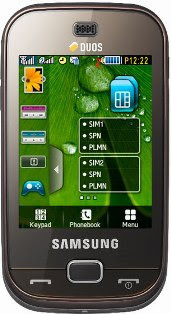 The Samsung B5722 Duos is a Dual SIM Touchscreen mobile phone with a very long battery life. Samsung B5722 Duos is the first Dual SIM mobile phone from Samsung with touchscreen display. Being the first of its kind, the Samsung B5722 Duos has a list of impressive features for music aficionados and tech savvy users. Besides, the wide display adds to the appeal of the touch screen option. * The microSD (TransFlash) memory card in Samsung B5722 duos allows the phone memory to be expanded to about 8GB. The all new Samsung B5722 Duos is available in Dark Brown and Elegant Pink. This impressive handset is priced at Rs. 8,805 and is available with free shipping at Infibeam.com. Get hold of the Samsung B5722 duos and let your style speak for you.